KISS have topped the fan voting for the 2014 Rock & Roll Hall Of Fame. 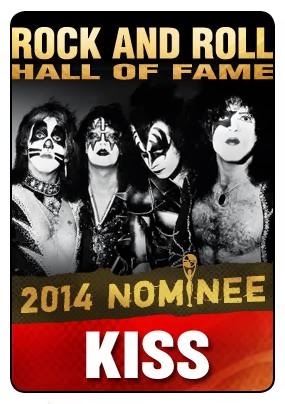 When the public ballot closed last week, KISS led the nominees with 239,417 votes, or 17.22% of the more than 1.39 million votes cast. Nirvana came in second (218,155 votes / 15.69%), with Deep Purple at No. 3 (165,828 votes / 11.93%), Yes at No. 4 (151,238 votes / 10.88%) and Daryl Hall & John Oates at No. 5 (112,673 votes / 8.10%). The top five artists, as selected by the public, will comprise a “fans’ ballot” that will be tallied along with the other ballots to choose the 2014 inductees. In order to be eligible for this year's ballot, artists or bands need to have released their first single or album in 1988 or earlier. The 2014 inductees are expected to be revealed soon.